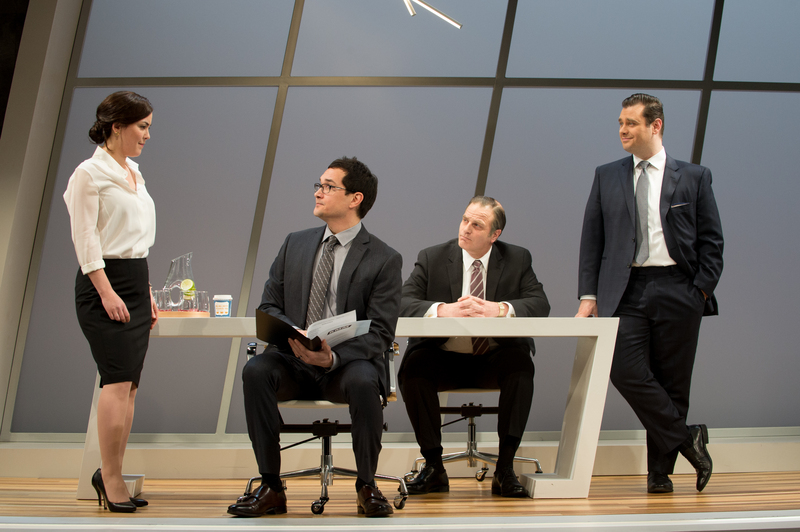 Written by first-time playwright Sarah Burgess, Dry Powder takes the audience into the elite world of high finance and risk, where the line between “good” and “bad” is blurred with the prospect of money. At Seattle Repertory Theatre’s Leo K stage, director Marya Sea Kaminski perfectly blends comedy and drama to keep her audience laughing, yet thoughtful. And as a novice to theatre in general, this showing blew my socks off. Seattle Repertory. 2017. Dry Powder. Photo: Jenny Graham. It was clear from the first few moments that Rick (Shawn Belyea), the president of a private equity firm, was a no-nonsense man and made that clear to his two subordinates, Jenny (Hana Lass) and Seth (MJ Sieber). Rick is the decision maker, hopping back and forth between Jenny and Seth’s arguments for their most recent investment with company owner Jeff (Richard Nguyen Sloniker). Seth plays the slightly more moral partner who tries to find an unlikely win-win situation in the buyout. Jenny however, is the obvious crowd favorite, receiving more than chuckles for her massive ego and dramatic lack of patience for any decision that might lose her company money. Between eyerolls and glances loaded with contempt, Hana Lass and MJ Sieber nail their roles and transport the audience to a ninety-minute experience of high-stake finance with good humor and edge-of-your-seat arguing. The set exceeded expectations. From the background shouting of the “protest” preceding the show to the upbeat music in between acts, I never felt more immersed. The clean, white furniture aptly portrayed the modern art of the upper class, and the transitions supported the fast-paced environment of the company. The only slight fallout were the glaring lights in the office scenes, where I and many of my neighbors had to pause and rub our eyes due to the brightness. They did the actors well, highlighting their pristine suits and skirts, but were harsh for audience members around the room. The tremendous acting and story of the play, however, overshadowed this minor detail. Witty and daring, Dry Powder is a must-see, especially in our political environment. Grab your friends, family, and arrogant money-loving colleagues for a night out in finance.